Catherine Kehoe works small; her paintings at Miller Yezerski Gallery are rarely more than a foot tall, and often half that. She paints simple scenes of tremendous complexity. 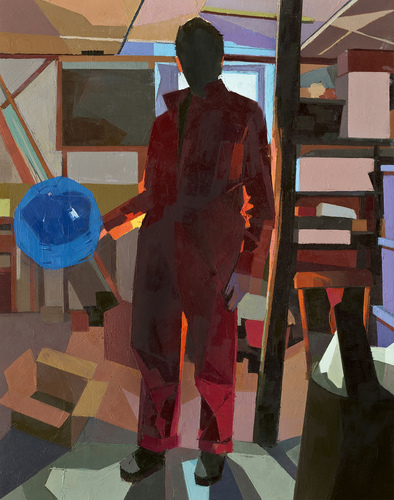 In “Orange Jumpsuit,” one of her larger works, Kehoe backlights a figure in orange, darkly translucent, holding a blue ball. Light bounces through the space around her. This is a great trick: a figure painting in which the surroundings carry as much weight as the subject. Colored planes splay and bank around the space like tossed playing cards. Terra cotta and green shafts slant across the floor. A beam, a window, a chair back, an open box, each represented by simple blocks of color, send us ricocheting around the room, delightedly trying to discern what is solid, what is light, what is shadow; we see the puzzle pieces, and the eye works to put them together. In some ways, Kehoe is an abstract painter, paring down still lifes and interiors to juxtapositions of flat color hung on formal skeletons. 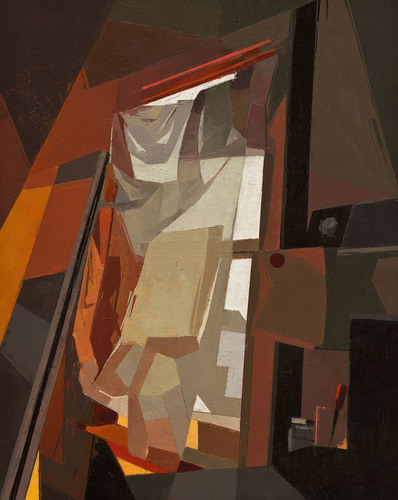 A strip of orange, a line of peach, billowing blocks of beige — the translucent curtain in “Window Inferno” — tilt us into a warm world of ordinary things, yet we can’t quite find our bearings. Kehoe, then, puts us on the alert, wakes us up. This is what painting is meant to do.